Antonio Stradivari is well known as a prodigious and celebrated maker of violins and cellos. 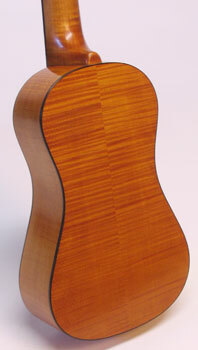 He also made a few guitars and some mandolins, but its pretty safe to assume that he never made any ukuleles. One of his guitars, made in 1700, was recently on exhibit at the Boston Museum of Fine Arts. 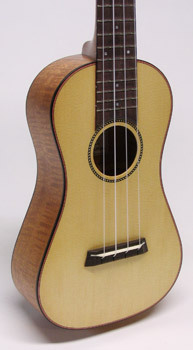 Its long-waisted shape, and understated ornamentation inspired this concert size ukulele. 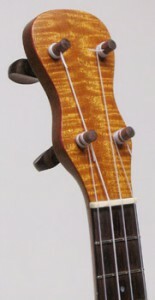 The headstock mirrors the body shape in a style that is typical in Portuguese and Hawaiian instruments, but also not uncommon in Italian guitars of the period. 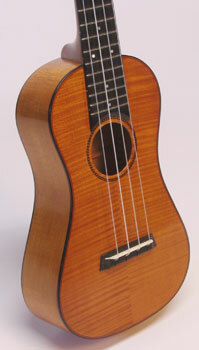 The uke is available in curly mahogany, koa, or maple, with rosewood or ebony binding and a rope style rosette. A spruce top is an option. Traditional violin tuners are standard. Pegheds™ machine tuners are also available. The instrument can be finished in tru-oil, lacquer, or antiqued violin varnish. The Stradelele is currently played by classical ukulele master, John King.